Do you have an RV? Are you considering getting rid of most of your worldly possessions, scaling down, and simplifying life by moving into the RV and living in it year round? Are you considering full time RV living? Maybe you don’t own an RV but you are curious about the lifestyle and think it might be a great idea based on your current situation and knowledge. Or, maybe you clicked on this website’s link because you may have already begun to live in an RV for an extended period of time and you are looking for more ideas. 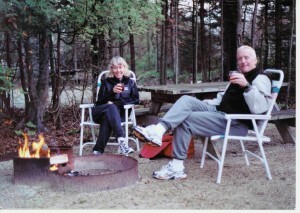 Pam and I have been enjoying full time RV living since 2008. We have come across many folks, as co-workers in RV parks, as well as other RV travelers in our many visited locations. We have found that a few stick with full time RV living on a long-term basis and others don’t last because they failed to prepare for what life on the road was really going to be like. It’s great when you go out RVing for a few weeks on vacation, get away from the job and stresses of daily life, and have a great time in great places in an RV. It’s time spent with loved ones and it brings many happy memories for years to come. But, is it different taking a vacation compared to the lifestyle of full time RV living? If you are independently wealthy and have no money worries, life on the road is easy. But, if you are not, there can be significant costs to the lifestyle, and entering into it bringing debt, and no prospect of a respectable income is definitely not recommended. However, if you sell off any real estate you own, have a nest egg or savings plan in place, and you can buy your home on wheels with no recurring debt, then the full time RV lifestyle may work out for you! I always have to ask people, can you and your spouse/partner live in two to four hundred square feet without driving each other crazy? I know people who can barely live in the same house without quiet time away from each other each day. What would happen in an RV? Life on the road can be affordable if you are not driving mega miles each year. You can work camp to supplement the cost of parking your RV so you have your water, sewer, and your electric needs met. These become the basis of a comfortable full time RV living lifestyle. Again, I caution people to be realistic in their plans and to really think about what life on the road will be like. Imagine 200 – 400 square feet, 24/7 with your spouse or partner, and no place to hide if things go south. You know what I mean! We all have times where we don’t agree. It’s not all like Forest Gump and “we get along like peas and carrots!” We have worked with folks that Pam and I wonder how they do it! They are always fighting. Maybe that’s their way of communicating? LOL! Can You Live Without All the Stuff You Have? Can you live without all the stuff you have accumulated over the years? Are you going to sell it or pay for a storage unit and keep some of those things you can’t part with? Here’s one example of scaling down! Pam and I took all our photos and scanned them. We have them archived electronically. We have one of those electronic picture frames. We look at our photos now more than we ever used to. We were able to get rid of the originals and not have to store them somewhere. We also took all our DVD’s out of those bulky plastic boxes and stored them in a storage case designed for CDs. We now have no problem taking our whole collection along! Can you leave family members behind and not see them as often? Do you come from a large family, and you all are close, and they expect you to be around for every family gathering instead of gallivanting around the country in a box on wheels? Hey, these are important issues to consider! We have seen situations in our travels where people have to return home because the RV lifestyle was not what they thought it would be. They just get too homesick! These are just some of the things that have to be considered when entertaining the idea of hitting the road for full time RV living! Now, for Pam and I, we started looking at RV’s back in the mid-eighties, even before they started putting slides in them. It was a business goal of ours to buy one once we could afford it. I structured business ideas around being able to travel in one while working on the road. We just knew that this was the lifestyle for us. We are nomadic. We have small families and I would say we are not very close. We love each other, but we just have different interests. We enjoy each others company when we visit, but we have not been a huge part of each other’s lives. 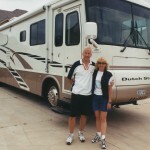 So for us, we have no attachments: just the two of us, our fur-kids, and our extended family of RV full timers like us! So, when the opportunity presented itself, we sold the 3,800 square foot house in the beautiful Colorado Rockies, moved to Florida to be closer to aging parents, and started the full time RV living lifestyle. We began work camping to pay for our RV site and hung around a Florida panhandle RV park while getting prepared to be fully mobile and able to pick up and hit the road when we were ready. We picked up ideas from others who had been enjoying the full time RV lifestyle for a while. We ventured back out west for awhile before returning to Florida to consider another business venture. We discovered that being a full time RVer is wonderful, but when it comes to taxes, there are no breaks! We lost all our major deductions by being debt free. So, the only way around that was to run a legitimate business out of the RV. We’ll get to more of that in upcoming posts! How About You? Will You Join Us? We want you to go into full time RV life being fully aware of what is to come. You need to be thinking of everything: how will life as you know it change once you are in an RV? How will bills be paid? What about banking around the country? How will you get your mail? How will people find you? Technology has made all this much easier! There are ways to make all this happen. We will also share some ways for you to do these things too. So for now, dream on! Get going! Do your research. Visit the RVing forums and see what others are saying about the full time RV living lifestyle. We hope to hear your story someday! We hope that something we shared here at yourfulltimervliving.com was valuable and was able to get you to where you wanted to be! Thanks Sunny! It was nice meeting you! Let us know if we can help you adjust to the fulltime RV living lifestyle! I’m interested in how expensive is your truck and 5th wheel. What is your truck for a brand. Thank you for visiting our website! Switzerland would be an awesome place to have a small class C RV to travel around in. I am not sure a setup like mine would get around easily? Trucks and 5th wheel RV’s here in the US can run $100 – $150k US. On the upper end you could spend $250k US. We do not use a production truck like a Ford, Chevy or Dodge because of the weight of the trailer and the pin weight of the 5th wheel. They can just not handle this particular 5th wheel. However, the Freightliner Sportchassis safely and easily handles the load. The fulltime RV lifestyle is awesome. Hopefully you will get a chance to try it out sometime!! My husband and I are concidering going full time.. We have a class A motor home now. 37Ft. But are thinking we may need to get a 5th wheel and truck. Our tow car is not very comfortable for 2 hour day trips and he really wants a truck. What brand of luxury 5th wheel would you recommend.. We have a nice savings and good retirement income so we can handle this. Loved reading your article and would love to learn as much about full time living in an RV as possible. .We have several rent houses in New Mexico and Texas so if we try it for a year and it just doesn’t work we can take one of the rentals. We both love being in the RV. Thank you for visiting our website! We loved always being in our RV too! That is why we decided to go full time eight years ago. We are so glad we did and know you will too! We have friends who have Redwood 5th wheels, DRV Elite Suites, and we looked at the Landmark 365 at the Tampa RV Supershow in January and were impressed with their quality! I would start with these three and see how you feel about the quality and floor plan that fits your needs. Really pay attention to fit and finish and don’t just fall in love with the curtains. Look underneath the RV, check out construction and insulation. Poke your head in every nook and cranny to see how the 5th wheel is built! If you do, the best 5th wheel RV for you will make itself known. Having an RV already I am sure you have a good idea of the floorplan that will best suit your full time needs. But, be sure to really think it through based on how you plan to use it. You want to be sure you can access the things you need while traveling without having to bring slides out! Best wishes as you move forward!! Certainly, Florida is the Meca of retirees who have migrated there to escape the cold and live in park model trailers and RV’s. Lot rent in RV parks varies in price depending on where in Florida you want to go. During the winter is when the prices go up: supply and demand. As far as jobs in Florida, if you want to work in an RV park while living there, that can save you from having to pay for your site, or get a job in your local area. It depends on what your financial needs are. Best wishes with your plans! I am having a problem with my surge protector constantly tripping. It’s been fine until this past Friday evening with weekend campers showing up and everyone turning on their ACs (90+ degree day). It was working fine up to this point. I tested the 30 amp outlet previously and found hot to neutral 120v, hot to ground 40v, and neutral to ground 0v. That being said, would a poor ground cause the surge protector to trip? Would it be reading this as a low voltage situation and trip? Thanks! Depending on the surge protector you are using, an 80v drop in the hot to ground would definitely shut it down. I would have the grounding issue checked immediately for your safety!